I still don’t think the much hyped ‘3D’ imaging is very good. It does not seem three dimensional to me. More like several flat planes set one behind the other. There is an illusion of depth, but it works best in what I take to be computer animated landscapes where the camera can swoop and fly. In the live action scenes I found – at best – it added nothing to the experience of the film. At worst (but to be fair there were few ‘worst’ moments) it distracted from the drama. Setting that aside, one other aspect of the FX really irritated me. Regardless of how good the technology is in some places, isn’t it remarkable that Hollywood still can’t create a convincingly old person? Poor Guy Pearce (Peter Weyland) who must have spent hours getting slathered in latex every day he was in front of the camera. To what purpose? He looked like a man slathered in latex. Why Ridley Scott could not have found an elderly actor to play the part I do not understand. I kept expecting a transformation scene, or a flashback, in which the latex would vanish and the point of using an actor in his forties would become clear. But no. The Titans lost control of their weapon and it wiped them out but not before they had built a fleet of spaceships and loaded them with deadly canisters of bio-gunk. The bio-gunk is still alive and deadly, as the crew of the Prometheus then find out. When the gunk infects a person it seems to go through a series of metamorphoses before growing into the Alien we know and love. Here’s the question at the core of the film: if the Titan’s made us in their image and are, so to speak, our creator-gods, then who created them? The puzzle is presented twice. First through Elizabeth Shaw’s equivocating Christian faith. (Exactly why is she so attached to that cross she wears? Is it really only nostalgia for her missionary father?) The second time is by way of David the Android, who lives and watches over his own creator-gods. Perhaps this is a philosophical question that it is worth devoting a whole film to, but let’s not pretend it hasn’t been done before. 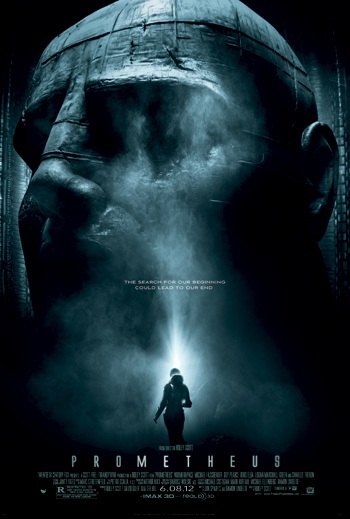 And if Ridley Scott does think this is a profound philosophical conundrum, why tackle it so superficially? Because the film is superficial. It is very obvious that it is being made for crass commercial reasons. There are many nods in the direction of the original Alien films (to reel in the punters who liked them) and many loose threads and unanswered questions (to open up the options for sequels). But set the film next to Scott’s gritty, sweaty and truely frightening original Alien and the sheer poverty of this new film is very apparent. Set it next to (for example) JJ Abram’s re-envisioned Star Trek film and the cack-handedness of Prometheus as a vehicle for kick-starting a failing franchise is also very obvvious. No. For me Prometheus just confirms that Scott is losing his touch. The IMDB site (where a version of this review also appears) is here. Nice review. Actually that was the most positive words I have read about the movie. Everyone else who have seen it seams to be much more critical than you are… Anyway, I seriously doubt I will see it. I still remember the visceral effect of the original Alien. No fantastic computer enhanced effects but all achieved with models, lighting, camera angles, suggestion and damn good acting. Scott was a better film-maker back then.